Night at a retail property can be fraught with danger for your customers. Make sure your landscaping isn’t a liability! The last word a property owner wants to hear is the word “lawsuit”. However, the many variables inherent in a unique property means that a poorly maintained landscape can increase liability, especially during winter conditions or at night. Common landscape issues can cause problems even in broad daylight. 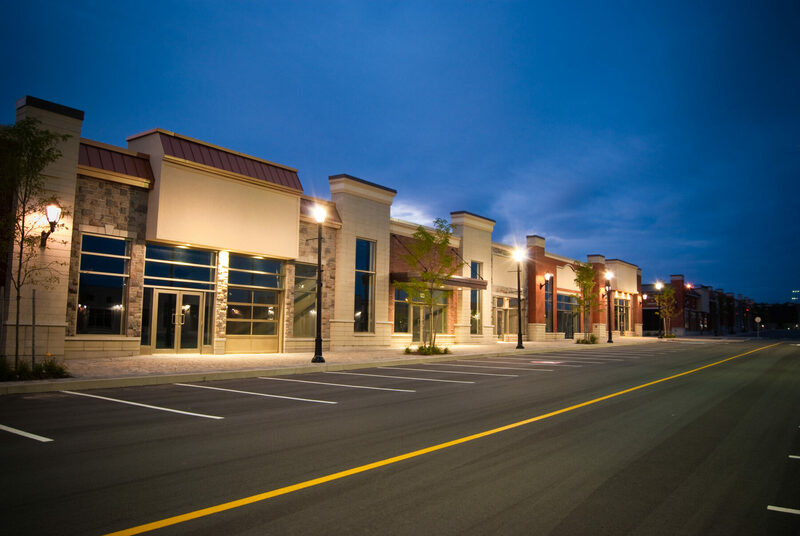 Luckily, property owners can take basic steps to improve nighttime safety at highly-trafficked retail establishments that will reduce their risk of being held liable for an injury. Here are the liabilities that affect most retail properties at night. Trees are a great way to add some natural beauty to a retail landscape, but you might be in for some nasty surprises if you ignore their health or proper pruning. Pedestrians may not be able to see or react to a diseased or compromised tree branch at night. Make sure your trees are properly cared for and pruned as necessary to avoid serious damage. Low and over-grown brush have the potential to block critical views for the safety of pedestrians and vehicles on your lot. This is a matter of concern not just for nighttime safety but also for safety during the day. A professional landscaper can utilize rejuvenation pruning to clear away any brush obstructing views as well as to promote healthy plant growth. Retail spaces can get a lot of traffic, so it is understandable to expect deterioration of walkways and patio spaces over time. Even with adequate lighting, pedestrians may find it difficult to recognize when a curb may be compromised or cracked. While you may be tempted to view this problem solely as an aesthetic concern, the risk of injury to your guests is significant. Take care of any repairs that may be needed to your hardscaping, curb, or asphalt as soon as they are identified. We’re no stranger to the effects of winter weather in the Mid-Atlantic region. At night, the risk of your guests slipping and falling due to ‘black’ ice is high. Your snow removal contractor should also have a plan in place for these situations, but touch base with them and let them know what the expectations are going to be when there’s ice on your property. This entry was posted on Friday, January 13th, 2017	at 2:31 pm	and is filed under Asphalt, Blog, Snow Removal	. You can follow any responses to this entry through the RSS 2.0	feed. Both comments and pings are currently closed.